Having an incredibly taut and toned body is the dream of many women. Living on a healthy, low-fat diet and following a robust exercise routine are the two biggest secrets to making it a reality. But not all concerns can be addressed easily with non-surgical options and flabby upper arms is the most common one among them. Though you can always accept yourself the way you are and make new friends with long-sleeved tops, this will completely ruin your dream of flaunting a firm and well-defined figure. Here comes the advantage of an arm lift. If cosmetic procedures do not make you uncomfortable, this is what you can try for toning up your arms. Keep reading to get all the details. Why Is Arm Lift Done? 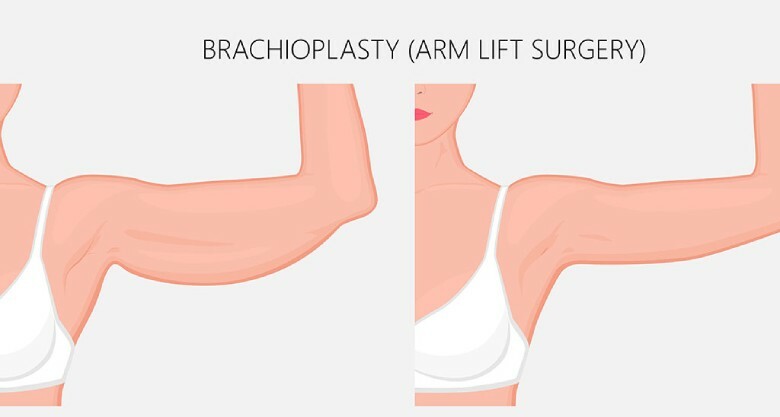 An arm lift is medically termed as ‘brachioplasty’. It is a cosmetic surgery procedure in which the underside of the upper arm is reshaped in order to create a more toned, defined, and balanced appearance. The treatment targets exactly the region between the armpit and the elbow for lifting the upper arm up. It eliminates localized pockets of fat from that area and reduces extra sagging skin that is causing droopiness. Moreover, it tightens and smooths the underlying supportive tissue before placing the remaining skin back over the recreated contour. As a result, the upper arm gets a beautiful, toned look. An arm lift can also help in reconstructing the arms successfully in patients of certain health conditions like lymphedema (1). Precisely, the arm lift surgery is done to restore the shape of the upper arm, which tends to droop or appears loose. There is a multitude of reasons behind this sagginess or droopiness including genetics, the natural process of aging, significant weight loss, specific health conditions (lymphedema), etc. But whatever may be the underlying cause, no natural remedy can reverse the condition by restoring the elasticity of the sagging skin. Even the most effective arm-toning exercises also can only strengthen and enhance underarm muscles while leaving the excess skin and fat intact. Hence, an arm lift is considered as the one and only solution for this purpose. Not everybody is a good candidate for an arm lift. If you are a healthy, non-smoking adult having serious skin laxity on the inside and back of your upper arms, you can opt for it. You must not be unusually overweight and your body weight should be relatively stable for at least 6 months prior to undergoing the procedure. Pre-existing medical conditions like connective tissue disorders or long-term intake of oral steroids can also make the arm lift surgery a risky choice for you. A preoperative evaluation helps your physician determine the safest approach to the surgery and it is imperative for you to follow the preparation guidelines provided by him religiously. If you are a smoker, quit it at least 1-2 months before the surgery to reduce your risk of complications considerably. Also, avoid taking certain medications, such as non-steroidal anti-inflammatory drugs, aspirin, herbal supplements, etc. to keep bleeding under control (2). 1. The surgeon starts the procedure by marking the exact locations on your upper arm where the incisions will be made. Typically, these marks are placed on the inside or the back of the arm. However, those can also be positioned at the armpit and extended up to the top of the elbow, depending on the preference of the surgeon. 2. Usually, general anesthesia is administered during this surgery to ensure the comfort of the patient. However, it can also be performed under intravenous sedation and local anesthesia, depending on the surgical method chosen for you. 3. Then, the surgeon makes incisions according to the marks. Based on the amount of extra skin to be eliminated, the length and pattern of the incisions can vary widely. 4. Now, he starts removing the additional fat present at those places either directly or through liposuction. The latter is mostly required to treat localized fat pockets that are hard to remove. For this, a cannula is inserted into the fat deposits and a suction pump or large syringe is used to vacuum them out. 5. Next, your surgeon tightens the underlying supportive tissue in your upper arm and secures it with internal sutures to create a new, toned contour. 6. After that, he drapes and smoothens the skin over the reshaped arm and removes the excess part. 7. Finally, the incisions are closed with absorbable sutures or removable stitches or surgical tapes. The surgical procedure of arm lift takes almost 2 to 3 hours to complete. You will have to stay overnight at the hospital after going through an arm lift. Your surgeon will cover your wound with bandages and an elastic bandage or a compression garment will be wrapped around your arm loosely. A small, thin tube will also be used temporarily for the drainage of excess fluid or blood. There will be a follow-up visit after 2-3 days when all these bandages and tube will be removed. Swelling, bruising, and discomfort are common for the first week. But those will settle down gradually. You may have to take pain medications and antibiotics for some days as per the instructions of your physician. You may also need to wear the compression garment for multiple weeks in order to shield your incision site from excessive force, abrasion, and motion. Get in touch with him immediately if you experience irregular heartbeat, chest pain, fever, or shortness of breath (4). You can start a few of your less strenuous activities within 2 weeks after undergoing an arm lift surgery. To resume your normal routine, you may have to wait up to 6 weeks. Take as much rest as possible during the healing period. Stay away from heavy lifting and demanding exercises for at least a month. Also, do not lift your arms above the level of your shoulders for 3-4 weeks. Typically, arm lift comes with extensive scarring that takes time to heal and is pretty difficult to conceal. Though the scars fade over time to a large extent, they never go away completely. You should protect them from sun exposure by using good sun protection and wearing outfits with long sleeves in order to keep them minimally visible. For a healthy, non-smoker patient, the arm lift scars can improve in a year or so. Just like any other surgery, arm lift also poses the patients at risk of various complications. These include prolonged swelling, excessive bleeding, infection, allergies, persisting pain, temporary numbness, poor healing of the wound, fluid build-up (seroma), fat necrosis, skin loss, unsightly scarring, asymmetry of the skin, adverse reaction to anesthesia, tissue damage, non-absorbed sutures, and need for revisional surgery. The results of an arm lift are long-lasting but not permanent. If you manage to stay fit and maintain stable body weight, you can enjoy its outcomes for a really long period of time. However, your skin will lose a certain degree of firmness naturally with age, causing a little sagginess to your treated upper arms. So, always keep realistic expectations. The average total estimate of the arm lift procedure can range from $3,500 to $5,500. It includes anesthesia fees, hospital fees, surgeon’s fees, and a number of other medical costs.